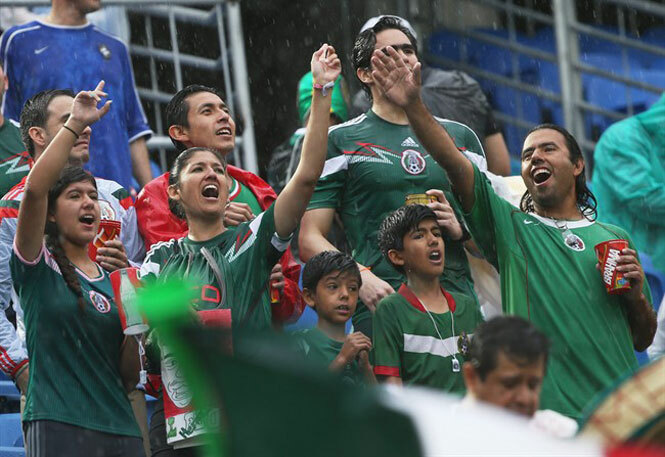 Mexican supporters shout in the rain before the start of the group A World Cup soccer match between Mexico and Cameroon in the Arena das Dunas in Natal, Brazil, Friday, June 13, 2014. RIO DE JANEIRO — A monitoring group has challenged the FIFA (International Federation of Association Football) to show leadership in tackling discrimination after the sport’s world governing body dropped an investigation of Mexico fans chanting an alleged gay slur. Closing that case ended potential FIFA action against Brazil’s football federation after fans exchanged the same chant during the host nation’s game against Mexico last Tuesday. Fare, which monitors discrimination at matches, said the ruling contradicted expert opinion and FIFA President Sepp Blatter’s pledge to use the World Cup to fight discrimination. FIFA can open disciplinary cases against national federations, which are responsible for fan behavior inside stadiums. Blatter has repeatedly said, including at FIFA’s congress in Sao Paulo two weeks ago, that points deductions are more effective than fines to solve such problems. Earlier Monday, Fare reported to FIFA that supporters from Germany, France and Belgium have worn black face make-up during matches. Fare insists the Mexican fans’ chant, traditionally aimed at the opposing team’s goalkeeper when taking a goal kick, is offensive. Still, FIFA disagreed and dismissed an improper conduct charge. Fare was invited by UEFA, which controls European football, to work at the 2012 European Championship and place spotters from participating nations among the fans to help identify offensive chants, flags and banners. That partnership saw several of 16 competing nations in Poland and Ukraine fined within days of abuse being reported. Croatia and Russia were repeatedly sanctioned. FIFA does not have a similar agreement with Fare in Brazil, although it has welcomed evidence from any source to support its match commissioners’ reports. On Saturday, images of at least two Germany fans appeared on social media with blackened faces at the team’s match against Ghana. FIFA said it was analyzing the incident, and the pitch invasion. It has also taken reports of far-right banners reported among Croatia fans at the June 12 opening match against Brazil, and from Russia fans at its first match against South Korea last Tuesday. Blatter has stepped up FIFA’s fight against discrimination in the past 18 months, and created a task force to suggest ideas.